Black Grape Slush by Guru Clouds A deliciously sweet mix of ..
Black Grape Slush by Guru Clouds A deliciously sweet mix of grapes and berries with no menthol or Koolarda. Options:Add 2 x 10mL 1.8% Nic Shots For 120mL of 3MG Nicotine E-liquidAdd 4 x 10mL 1.8% Nic Shots For 120mL of 6MG Nicotine E-LiquidPG/VG Ratio: 70/30Sold in 0MG Nicotine in a 120mL Chubby Gorilla bottle. ..
Blue Slush By Guru Clouds A delicious blue raspberry slushie..
Blue Slush By Guru Clouds A delicious blue raspberry slushie just like the one with the 'puppy' on the cup ! Options:Add 2 x 10mL 1.8% Nic Shots For 120mL of 3MG Nicotine E-liquidAdd 4 x 10mL 1.8% Nic Shots For 120mL of 6MG Nicotine E-LiquidPG/VG Ratio: 70/30Sold in 0MG Nicotine in a 120mL Chubby Gorilla bottle. .. Chilled Out Cherry By Guru Clouds A sweet cherry with a cool.. Chilled Out Cherry By Guru Clouds A sweet cherry with a cool menthol twist that is just like the sweet that help you breath more easily. Options:Add 2 x 10mL 1.8% Nic Shots For 120mL of 3MG Nicotine E-liquidAdd 4 x 10mL 1.8% Nic Shots For 120mL of 6MG Nicotine E-LiquidPG/VG Ratio: 70/30Sold in 0MG Nicotine in a 120mL Chubby Gorilla bottle. .. Cool Grape Soda By Guru Clouds A sweet refreshing sweet grap.. Cool Grape Soda By Guru Clouds A sweet refreshing sweet grape vape with a cool, refreshing icy blast. Options:Add 2 x 10mL 1.8% Nic Shots For 120mL of 3MG Nicotine E-liquidAdd 4 x 10mL 1.8% Nic Shots For 120mL of 6MG Nicotine E-LiquidPG/VG Ratio: 70/30Sold in 0MG Nicotine in a 120mL Chubby Gorilla bottle. ..
Donut Blood By Guru Clouds A sticky, sweet strawberry jam d..
Donut Blood By Guru Clouds A sticky, sweet strawberry jam donut vape that will leave your mouth watering. Options:Add 2 x 10mL 1.8% Nic Shots For 120mL of 3MG Nicotine E-liquidAdd 4 x 10mL 1.8% Nic Shots For 120mL of 6MG Nicotine E-LiquidPG/VG Ratio: 70/30Sold in 0MG Nicotine in a 120mL Chubby Gorilla bottle. ..
Hailstorm By Guru Clouds A mix of dark, sweet berries with ..
Hailstorm By Guru Clouds A mix of dark, sweet berries with a cooling menthol finish Options:Add 2 x 10mL 1.8% Nic Shots For 120mL of 3MG Nicotine E-liquidAdd 4 x 10mL 1.8% Nic Shots For 120mL of 6MG Nicotine E-LiquidPG/VG Ratio: 70/30Sold in 0MG Nicotine in a 120mL Chubby Gorilla bottle. ..
Heisenkiller By Guru Clouds Heisenbergh PLUS, sweeter, slig..
Heisenkiller By Guru Clouds Heisenbergh PLUS, sweeter, slightly less menthol and slightly more aniseed with a touch of bubblegum flavour too. Options:Add 2 x 10mL 1.8% Nic Shots For 120mL of 3MG Nicotine E-liquidAdd 4 x 10mL 1.8% Nic Shots For 120mL of 6MG Nicotine E-LiquidPG/VG Ratio: 70/30Sold in 0MG Nicotine in a 120mL Chubby Gorilla bottle. ..
Jamaican Sunset By Guru Clouds A unique blend of pineapp..
Jamaican Sunset By Guru Clouds A unique blend of pineapple and mango. This vape will make even the dullest days feel like that special holiday, time after time. Options: Add 2 x 10mL 1.8% Nic Shots For 120mL of 3MG Nicotine E-liquid Add 4 x 10mL 1.8% Nic Shots For 120mL of 6MG Nicotine E-Liquid PG/VG Ratio: 70/30 Sold in 0MG Nicotine in a 120mL Chubby Gorilla bottle. 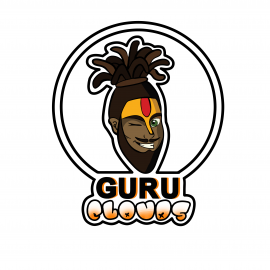 ..
Love Island By Guru Clouds A mystery vape with a blend of s..
Love Island By Guru Clouds A mystery vape with a blend of sweet, topical fruits to tickle the taste buds. One for the fruit lovers who will find it hard not to fall head over heels for this one. Options:Add 2 x 10mL 1.8% Nic Shots For 120mL of 3MG Nicotine E-liquidAdd 4 x 10mL 1.8% Nic Shots For 120mL of 6MG Nicotine E-LiquidPG/VG Ratio: 70/30Sold in 0MG Nicotine in a 120mL Chubby Gorilla bottle. ..
Ruby Red By Guru Clouds A beautifully blended vape that's f..
Ruby Red By Guru Clouds A beautifully blended vape that's full of promegranite, blueberry and aniseed with a cooling hit.Options:Add 2 x 10mL 1.8% Nic Shots For 120mL of 3MG Nicotine E-liquidAdd 4 x 10mL 1.8% Nic Shots For 120mL of 6MG Nicotine E-LiquidPG/VG Ratio: 70/30Sold in 0MG Nicotine in a 120mL Chubby Gorilla bottle. .. The Shocker By Guru Clouds A vape for the true menthol love.. The Shocker By Guru Clouds A vape for the true menthol lover who will find this a dream. Blue raspberry and lime blended with an intense hit of koolada AND menthol. This truly is A Shocker ! !Options:Add 2 x 10mL 1.8% Nic Shots For 120mL of 3MG Nicotine E-liquidAdd 4 x 10mL 1.8% Nic Shots For 120mL of 6MG Nicotine E-LiquidPG/VG Ratio: 70/30Sold in 0MG Nicotine in a 120mL Chubby Gorilla bottle. ..
Twister By Guru Clouds Bring back memories of your you..
Twister By Guru Clouds Bring back memories of your younger days with this twisted ice lolly flavoured vape. Options:Add 2 x 10mL 1.8% Nic Shots For 120mL of 3MG Nicotine E-liquidAdd 4 x 10mL 1.8% Nic Shots For 120mL of 6MG Nicotine E-LiquidPG/VG Ratio: 70/30Sold in 0MG Nicotine in a 120mL Chubby Gorilla bottle. .. Vanilla Pudding By Guru Clouds A sweet and creamy vanilla p.. Vanilla Pudding By Guru Clouds A sweet and creamy vanilla pudding flavour that is difficult to put down and wont affect your waist line ! !Options: Add 2 x 10mL 1.8% Nic Shots For 120mL of 3MG Nicotine E-liquid Add 4 x 10mL 1.8% Nic Shots For 120mL of 6MG Nicotine E-Liquid PG/VG Ratio: 70/30 Sold in 0MG Nicotine in a 120mL Chubby Gorilla bottle. ..
Vimto By Guru Clouds A refreshing mixed fruit vape of bl..
Vimto By Guru Clouds A refreshing mixed fruit vape of blackcurrant, raspberry and grape. Options: Add 2 x 10mL 1.8% Nic Shots For 120mL of 3MG Nicotine E-liquid Add 4 x 10mL 1.8% Nic Shots For 120mL of 6MG Nicotine E-Liquid PG/VG Ratio: 70/30 Sold in 0MG Nicotine in a 120mL Chubby Gorilla bottle. ..